Ever flown a kite or taken a photograph? Well, that's most of us isn't it! No wonder aerial kite photography holds such a fascination for so many people. These days, with relatively light digital cameras, it is becoming increasingly popular to take photos from kites as a hobby. Mind you, this trend might not continue forever, with the rise of cheap drones with built-in cameras. At the cheapest end of the scale, disposable cameras combined with ice triggers and balsa wood cradles used to be used. 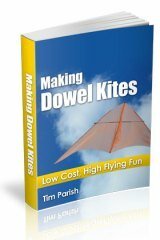 Under relatively small cheap kites. For example, see the movie at the bottom of this page showing a home-made Dopero. This kite is 'big' compared to some little Sled or Diamond you might buy for your 5 year old kid to fly! However, serious KAPers tend to use even larger kites, which can support the weight of more sophisticated photographic gear. Not to mention the R/C (Radio Control) gear to operate the camera while aloft! Down below is one of my efforts, taken with a Pentax Optio camera which was firing off one shot every 10 seconds. The lifter kite was a 2.4m (8ft) Barn Door. Not so serious, but determined to have some fun getting aerial photos? A range of tiny and therefore light cameras are available online. Some cameras have multi-shot options too. More correctly, the hobby is known as Kite Aerial Photography, or KAP, which is less of a mouthful. KAP equipment at the cheap and simple end of the scale is within reach of just about anyone. However, some enthusiasts go to much more trouble and expense to get great pictures! 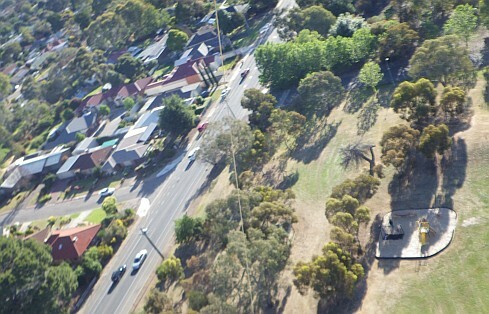 Some enthusiasts of aerial kite photography are after quality at any cost. Hence, they spend many hundreds of dollars on high-end cameras, radio-control gear and special equipment to suspend it aloft with a minimum of movement. Why the R/C gear? Well, the camera can be panned around to get the best shots, and the shutter clicked on command. While these are the 2 main functions, there could be others like switching settings on the camera. 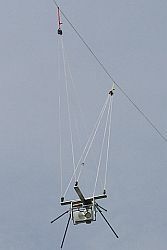 The photo above shows a typical KAP rig, hanging from the flying line of a large kite. Used with permission from a nice German kite site. Be aware there is very little English text on the site. However, there are some interesting photo sequences on the KAP pages. 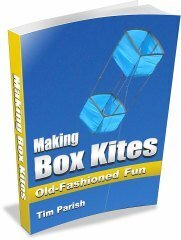 I was browsing around another KAP enthusiast's website the other day and he made an interesting point about what draws people to the hobby. He theorized that it's part of our human nature to want to see things from an aerial perspective. To support this idea, he mentioned the fact that aerial views of cities and landscapes were sketched or painted long before any flying machine was invented! 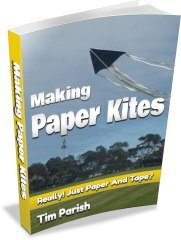 The hobby of aerial kite photography got started in earnest around the mid 1980s. However, the very first examples of such photos date back to not long after photography itself was invented. 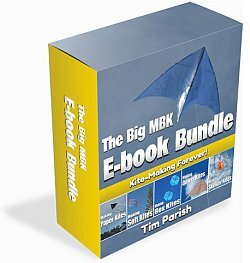 Before digital cameras became cheap, or even existed at all, keen KAPers would willingly hoist many hundreds of dollars worth of photographic gear up under their kites in order to take high-quality panoramic pictures. A quite famous aerial photograph was taken from a kite in 1906, documenting the San Francisco earthquake. A KAP enthusiast named Scott Haefner did a re-shoot of this striking picture, close to its 100th anniversary. A small group of experts known as Team Drachen made good use of some grant money by using KAP to document whale behavior. This took place at San Ignacio Lagoon, Baja, in Mexico. The appeal and intrigue of aerial kite photography was enough to entice Discovery Channel, Canada, to do a video clip on the hobby in January, 2004. In November, 2002 a 360-degree panorama of the San Andreas Fault was created from KAP images. Several other striking subjects got the 360 degree treatment as well. Here's a just a few samples of some photos taken from kites. Here's just a few interesting snippets from the past giving you some idea of the origins and growth of the hobby. Just as the Cody kite and other early box kites were associated with military uses, so it was with aerial kite photography. In fact, advances in KAP techniques were a result of military use and experimentation for many years, starting in the late 1800s. The first notable aerial kite photographer with no military connections was probably Arthur Batut, from France. He was passionate about photography and succeeded in developing a simple system to take photos from a large diamond kite, many hundreds of feet in the air. At this time, people had never seen images from an aerial viewpoint so the pictures caused a sensation! Believe it or not, Batut's pictures were made possible by advances in photographic technology! Even back in the late 1800s, photography had been around for 60 years or so. Weights and sizes had come down. Exposure times had decreased also. 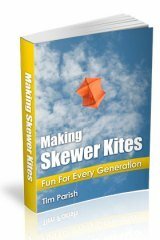 A slow burning fuse triggered the shutter release, after which a white flag dropped and the kite was reeled in. Simple but effective. Skipping forward to the 1980s now. This is when KAP as we know it started to become widespread. An organization called KAPWA, a worldwide association of KAP enthusiasts, came into being. This organization, now known as the KAPWA Foundation, has organized events and made resources available to interested hobbyists since the 1980s. In September 1987, the 75th anniversary of the International Competition of Scientific and Military Kites was celebrated. The competition was held in Belgium in 1912. Between 1989 and 1993, KAPWA actively shared information and organized events with the Japanese Kite Aerial Photography Association. Over the years, KAPWA has also been involved in more than twenty exhibitions of the finest aerial kite photography that could be found amongst its members. These exhibitions took place on just about every continent except Europe. Interesting, since France is where it all started! International meetings specifically about aerial kite photography were also convened.